I still share pictures that taken around Pangandaran Beach (Ciamis, West Java, Indonesia). 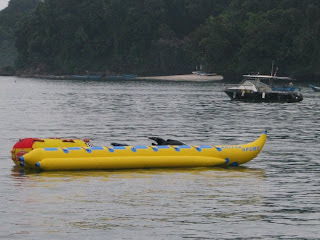 It’s still early in the morning -7 am- this banana boat has been ready for its passengers. 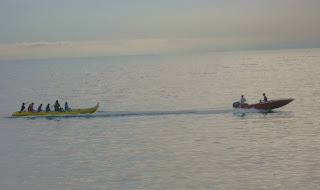 It looks fun riding a banana boat, but I haven’t yet tried it. Have you? I would like to go on for a ride Lina hehehe.. It is 3 degrees here now, it would be nice to be out in warm place. Love to try riding banana boat. Great MYM post. wach,kapan ya saya bisa naik banana boat itu..?? I do one time I enjoyed it a lot though I am scared of open water. Love to do it again hehe! Happy Monday! A banana boat! I haven't seen like this before. I can imagine how fun it is to ride on it. Good take for MYM.